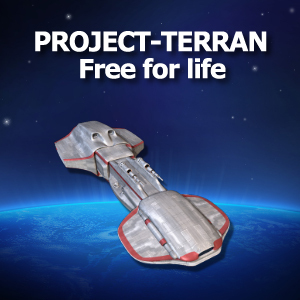 Project Terran is a Sci-Fi browser game. It takes place in a single Galaxy Called Phoenix. There are 119 Systems with 775 Locations. Play style is PVE with immersive community interaction. There are Four Factions. Colonial Union, Commonwealth Of Planets, Foreen Alliance & the Planetary Federation. Although humanity is now spread out through the Galaxy all newcomers start their journeys at Atlas Station in Terra. It's a great open-ended game. You can develop your characters in multiple directions, including mining asteroids, hauling freight, delivering commodities, fighting enemies, or crafting new ships, weapons, or a host of ship upgrades. You can train any character any of the skills that are required to advance. There are missions that teach the game mechanics, and then missions for each career path to earn credits and better gear.